Everything at Soif is corked. No, no, not the WINE. The wine and the food (OMG) are fantastic. I'm talking about the walls. The floors. Some of the tables, parts of the bar, pieces of artwork. All made of cork. A startling revelation as you walk in the door; this is, indeed, a one-of-a-kind place. 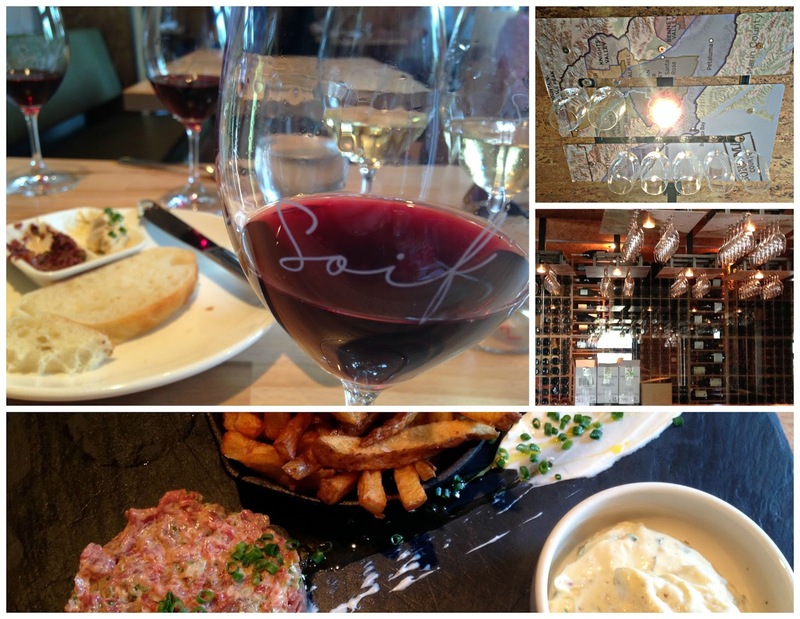 Soif Bar à Vin is owned by Véronique Rivest, a local sommelier who rose to fame in 2006, when she was crowned Canada's Best Sommelier. She followed that up with several other victories, most notably in 2013, when she came in second place at the World's Best Sommelier competition in Tokyo--the first woman in the world to do so. Needless to say, she knows her stuff. Now she runs this little bistro in Gatineau, Quebec, just a quick drive over the river from Ottawa's downtown core. Blink and you'll miss it; there aren't any signs marking its existence in what looks like a commonplace set of brick row houses-turned-storefronts. Inside, the nifty all-cork décor is enhanced by S-shaped panels hanging from the ceiling that bear maps of the world's wine regions, and which double as both lighting and glassware holders. Larger wine country maps hang here and there for closer perusal. A massive U-shaped tasting bar is situated beside a glass-walled wine closet into which patrons can peer and drool over the collection. The menu is short, dominated by small plates, and changes frequently. I immediately zoned in on bison tartare while Hubby went for an open-faced steak sandwich. We nibbled on fresh baguette and olive tapenade while our server set out glasses for our "Petit Trio" of wines. I picked the white set, which featured lesser-known grapes from Italy and the Canary Islands; Hubby chose the all-cabernet franc flight from a little place called Chinon, in France's Loire Valley. Marco de Bartoli 2013 Terre Siciliane Vignaverde (Sicily) - Grape: grillo Aromas of chamomile, linens, wet stone, lime and asparagus. Fairly light with pronounced acidity, ending tart on the palate. Cascina degli Ulivi 2014 Bellotti Bianco (Piemonte) - Grape: cortese A floral nose blended with hints of honey, butter and caramel. Bracing acidity is softened by tropical fruits, leading into a smooth, nutty finish. Suertes del Marqués 2013 Valle de la Orotava Trenzado (Canary Islands) - Grape: lístan bianco I was most eager to try this one. The varietal is more commonly known as palomino, which is normally used for making sherry. I'm not much of a sherry drinker, but as this was done in a different style, I figured I'd give it a go. Sadly, the overwhelming, funky nose of smoke and canned vegetables, along with a bitter and rough flavour profile reminded me why I don't drink sherry. Domaine Jaulin-Plaisantin 2013 Chinon Le Dolmen - Fragrant rose and violets with ripe cherry, rooted firmly by green pepper, peppercorn, leather and cloves. Tannins are soft, balance is good, finish is subtle. Château de Coulaine 2013 Chinon - Herbal notes of oregano mixed with pine or cedar (not sure which). Earthy, fungal flavours on a velvet texture, with a sudden gush of ripe berries that explodes on the finish. Phillippe Alliet 2013 Chinon - A much sweeter version of cab franc. Bubble gum, banana and candied cherry up front, giving way to luscious, juicy red fruit, chewy tannins and a strong backbone of acidity that lingers. The tartare was tender and flecked with spice and plump capers, accompanied by crisp frites and crostini, and homemade mayo. The steak sandwich was served up medium rare on baguette, under a thick blanket of melted mozzarella. For dessert, an enormous brownie with a chewy exterior and molten chocolate heart hit the spot, and was a harmonious match with the de Coulaine Chinon. Throughout the meal, we were tended to by Madame Rivest's knowledgeable and gracious staff, who I am delighted to say are of the same impeccable calibre as Stephen Beckta's crew. A rare and wonderful find. We wrapped up our all-too-brief workday lunch; it would have been much nicer to linger at the tasting bar, or stretch out on the patio with something light and lovely in hand. I can imagine Soif at night being the happening place to be, as well as a secluded, romantic nook for couples. As we walked out, I caught sight of Madame Rivest herself behind the bar, topping up glasses and laughing with the customers. I hope to return again soon for more of Soif's delicious food, and perhaps a chance to chat with this celebrated sommelier, in her little cork bistro. Editor's Note: For those of you who have been to and loved Soif, it's up for the enRoute Magazine People's Choice Award. Vote online here.